Star Wars 9 End Battle Scene & Kylo's Green Lightsaber Teased in Set Leak? Star Wars 9 is continuing to shoot leading into the holidays before everyone takes a well deserved break. But certain cast members will be back on set in early January, as J.J. Abrams brings principle photography to its conclusion. A new rumor claims he is filming a gigantic end set piece that will depict a battle to end all battles. It claims to have Rey slaughtering Stormtroopers with her new lightsaber, like she was Jason in a cornfield full of teens at an outdoor rave. This all sounds pretty cool, if true. One of the final scenes of the third act is rumored to be shooting at Pinewood in the UK at the start of January. The scene allegedly involves Adam Drive sitting inside of a cockpit. It is either his shuttle pod, or he is in a TIE Silencer. He is attacking a base. One of the sets involved in the shoot depicts the ruins of this Resistance base. There is a lot of fire and rubble. Richard E. Grant will be working on set with Adam Driver, which is further fueling speculation that he plays a key member of the First Order. Adam Driver and Richard E. Grant are said to be shooting a pivotal scene together in a control room. There will be about thirty extras dressed as Resistance fighters as they battle around a dozen extras dressed as Stromtroopers. Daisy Ridley will be on set as Rey, and she will get to brandish her new lightsaber, as she goes after some of the Stormtrooper soldiers, laying waste to many in one fail swoop of the blade. Kylo Ren will be watching from above as Rey battles these forces. Keri Russell will also be on set, if this proves to be true, and will engage in the fight scene with a blaster. She is reportedly wearing an all-black suit with a black cape. Billy Dee Williams will also allegedly be on set. He will be stationed inside of a cockpit, which is something we've heard multiple times in previous rumors. It is believed that he is sitting in the Millennium Falcon. The scenes are being shot out of order, but it is believed that his scenes are part of this giant skirmish, with Landon getting a taste of the battle. There are believed to be special lighting techniques being utilized that will represent the entire scene taking place at Dusk. It is being called one of the most visually breathtaking fight scenes ever shot for a Star Wars movie. This should be one of the biggest battles in any of the Star Wars sequels to date. This giant set piece is said to tie into another important chase scene that pits Lando and Chewbacca in the Millennium Falcon against Kylo Ren in his TIE Silencer. We all know how he feels about his father's old ship, so it's speculated that he will be trying very hard to blow the hunk of junk out of the sky. There has been a long standing rumor that the Millennium Falcon would get destroyed in Star Wars 9, obliterated in a giant fireball. But the ship will survive, confirmed by the fact that it is a key piece of Star Wars: Galaxy's Edge. The lore behind the Millennium Falcon ride for that attraction is that it landed on Batuu after the events depicted in Star Wars 9, so the iconic ship will be coming out unscathed. A recent photo from The Star Wars Show confirmed the Kyber crystal in Rey's lightsaber, which belonged to Anakin and Luke before her, has been broken in half and is irreparable. So she will more than likely be getting a new lightsaber in Star Wars 9. 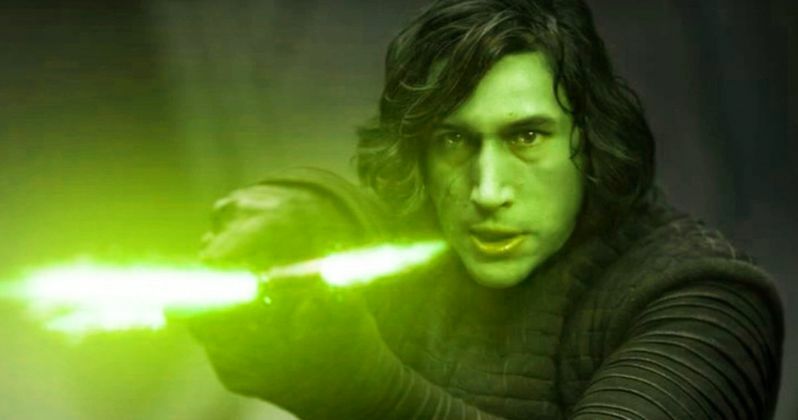 In an interesting twist, Kylo Ren is also rumored to be getting a new lightsaber, his Kyber crystal will be green just like his former Jedi teacher Luke Skywalker. Leaked art purportedly shows Kylo Ren sitting at a work bench, surrounded by tools. There is a crossgaurd lightsaber hilt, but it looks more ancient than the one used by Kylo in the two previous movies. Part of the hilt is slit open, and a green Kyber crystal is seen inside of the chamber. It appears that Kylo has put the Kyber crystal into a redesigned hilt. The crystal is not cracked. It is possible that he has gotten his hands on Luke's old green lightsaber, and he is trying to make it bleed red, as Sith do with all stolen Kyber crystals. Or, he could be turning to the Lightside. You can go ahead and pick which scenario you like better, the truth probably wont be revealed until the movie. But it's possible that we could see Kylo swinging a green lightsaber in the first teaser trailer just to spur on some heavy speculation and discussion heading into the release. There is no word that Finn and Poe are involved with this giant battle, which is being described as all out war. It is suspected that the end of the movie will take a huge cue from Return of the Jedi, keeping segmented groups of the main characters all separated. There is also no word as to were Rose is in all of this. Or if she's even playing that big of a role in the movie. I'm sure this news will upset some, and perhaps make others cry butter-flavored tears. We do know she is in the movie. But at what capacity? So far, it sounds like she'll only be getting one figure this time around. This latest Star Wars content from the future comes from Mr. Michael Zeroh at Drunk Chicken TV.